Brad Ausmus, by all accounts, will be back to manage the Tigers in 2017 (even if that news is not, as of this writing, official). There's nothing you can do about it. There's nothing I can do about it. It's happening, so we might as well get used to the idea and start working on resigning ourselves to the inevitable. But resigning yourself is one thing. What I refuse to do is cross over from resignation into some kind of bizarre baseball-style Stockholm Syndrome, where I begin to say silly things like "well, 2016 wasn't all Brad's fault," or "he wasn't really that bad, anyway," or other such lunacy. Of course 2016 wasn't all his fault, just like it wasn't all the fault of starting pitching, or all the fault of streaky offense, or all the fault of the bullpen. None of those areas were entirely at fault, but we damned sure expect the team to improve in those areas, don't we? Same goes for Brad. 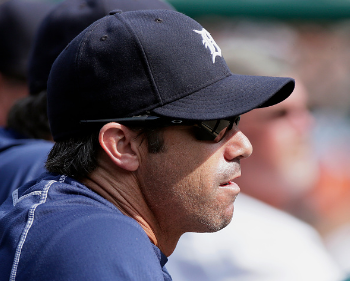 There is only one question that needs to be answered when contemplating whether Brad Ausmus needs to be replaced: is he a good manager? That's it. That's the only question. Resist the temptation to be distracted by irrelevant follow-ups like "well, is anyone really a good manager? ", or "how many managers do the exact same things? ", or "who would replace him?" One question: Is. Brad. Ausmus. A. Good. Manager? In a tie ballgame in the eighth inning, the Tigers had runners and second and third with two outs. The go-ahead runs. James McCann was due up, and with two left-handed mashers on the bench, Ausmus made the right decision to bring up a pinch-hitter. But he brought up the wrong guy. Instead of calling for right-hand-pitcher-killer Jarrod Saltalamacchia with first base open, he called for Victor Martinez. V-Mart was promptly walked intentionally, because duh. Then he called for Saltalamacchia, and it was a no-brainer for opposing manager Dusty Baker to bring in a lefty pitcher and force Salty to hit from his weaker right side. He struck out to end the threat, because duh. Ausmus later admitted in the post-game press conference that he figured V-Mart would be intentionally walked. So much face-palm. Reverse those two pinch-hitters and maybe you actually win that game. The Tigers scored nine runs and didn't win the game. After being down 9-2 through five innings, they mounted one hell of a comeback. A two-run HR by J.D. Martinez made it 9-4 in the sixth inning. A grand slam by Ian Kinsler made it 9-8 in the seventh inning. A solo shot by Victor Martinez made it a tie game in the eighth, and the impossible had happened. They had a real shot at winning this game. Angels' manager Mike Scioscia used his closer, Huston Street, in the ninth because the Manager Bible says you're allowed to do that if you're at home. Brad Ausmus was not at home, and he is Old Managerial Religion's most dedicated sycophant altar-boy, so instead of using his closer in the ninth to preserve the tie game, he went to Mark Lowe. Mark Lowe, who in just twenty appearances so far had racked up a 6.75 ERA and three blown games. He walked his first batter and gave up the walk-off HR to the next batter. With the Tigers ahead 4-3 in the eighth inning, Justin Wilson got two outs, but loaded the bases and had Troy Tulowitzki coming up. They just needed one more out. But The Manager Bible says your closer is for the ninth inning, and this wasn't the ninth, so Ausmus went to Alex Wilson instead. Wilson had, at that point in the season, already allowed 45 percent of his inherited runners to score, and he was being used here with literally as many baserunners on base as the game permits. He promptly gave up a two-run single and the Tigers lost. Ausmus later said he didn't want to use K-Rod for a four-out save because K-Rod isn't a young man these days. A couple of weeks later, in a game against the Red Sox, he used K-Rod for a four-out save. Locked in a head-to-head race for a wild card spot, the Tigers entered a three-game home series against the Baltimore Orioles, needing very much to win the series and put some distance between themselves and the O's in the wild card race. They won the first game of the series, and had originally planned to start lefty Daniel Norris in the second game. As a team, the Orioles hit .263/.322/.461 against right-handed pitching, but only .234/.301/.392 against left-handed pitching. Norris would have given the Tigers an advantage right out of the gate. Zimmermann, on the other hand, was just coming off a series of rehab assignments and many months of god-awful pitching. In his final rehab start against minor-league hitters, he failed to finish five innings, gave up two home runs, gave up six hits, and only struck out three batters. So of course, he started against the Orioles instead of Daniel Norris. He failed to make it out of the second inning, giving up three home runs and six earned runs, and the Tigers lost the series. Yes, the decision to give Zimmermann that start in the most important series of the season was no doubt a group decision, but ultimately it's Brad Ausmus who writes out the day's starting lineup. The final decision was his, and he botched it. Casey McGehee can't hit. He can barely get on base. His OPS+ this season was 39, which is fantastic if zero is the average, but it isn't -- 100 is the average. Casey McGehee is awful at the plate. And yet somehow Brad Ausmus managed to use McGehee in three different pinch-hit situations against the least likely relievers you can imagine: Wade Davis, Zach Britton, and Andrew Miller. On June 18, he pinch-hit for Ian Kinsler (what) with two outs in the ninth (what, what) in a game the Tigers were losing 15-6, against Wade Davis (dude). No idea. On September 11, in that same must-win Orioles series, the Tigers put the tying runs on base with two outs on the ninth. McGehee pinch-hit for Erick Aybar against Zach Britton because ... well, actually, Brad had a reason. You see, McGehee hits balls low in the zone, and Britton throws some pretty devastating sh*t low in the zone. Make sense? Send a guy who can't hit his way out of a wet paper bag to face a lethal pitcher, because the guy at the plate can sort of his precisely those pitches that, for this pitcher, are unhittable. God forbid you send up someone who's a better hitter all around, in general, and wait for Britton to make a mistake up the zone. Because if he makes that mistake against McGehee, well, sorry Chuck, our boy Casey can only hit the low stuff. You know, the stuff Britton is best at. It was a dumb decision, and it wasn't any less dumb when Ausmus repeated it a week later in an important game against the Cleveland Indians. It's just that this time the pitcher was Andrew Miller, and the logic was every bit as flawed. Send up a low-ball hitter who in general can't hit worth crap against a guy whose best pitches are his low-ball pitches. There are plenty of other examples. Those are just the ones that came to mind first. I'm sure I've flat-out blocked others from memory because they were so ridiculous. But Ausmus is coming back regardless, and it remains true that a really, truly, very good team can win despite having an idiot for a manager -- the Royals already proved that. So I suppose I'll just hope the Tigers can be better at baseball than their manager is at strategy and leave it at that. But don't tell me he's not that bad. And don't tell me he doesn't cost the team games. Not unless you want me to try to sell you tickets to the Lions in the Super Bowl this year.